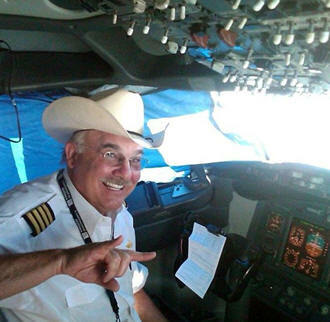 September 29, 2013 - On Thursday a United Airlines pilot suffered a heart attack at the controls Flight 1603, he has been identified as 63 year old Henry Skillern of Humble, Texas he later died at Saint Alphonsus Regional Medical Center. United Flight 1603 departed George Bush Intercontinental Airport, Houston, Texas at 5:40 PM for Seattle Tacoma International Airport, (SeaTac) SeaTac, Washington with 161 passengers onboard a twin engine Boeing 737-900. Enroute to SeaTac Captain Skillern began to suffer a heart attack at the controls. The copilot took control and notified a flight attendant of the situation. Captain Skillern was removed from the cockpit and taken to the first class cabin. A flight attendant requested over the intercom system if there was a physician on board. Two medical doctors from Madigan Army Medical Center onboard came to the pilots aid and began performing CPR. An off duty pilot went up into the cockpit to assist the copilot. The copilot contacted air traffic control at 7:55 PM to report Flight 1603 needed to make an emergency landing he further stated “We got a man down, chest compressions going on right now. I’m not sure too much right now the status. Can an ambulance and maybe some air stairs meet us on the runway?” The Boeing 737 was diverted to Boise. At about 8:10 PM United Flight 1603 touched down at Boise Airport Boise, Idaho where Captain Skillern was rushed by an awaiting ambulance to Saint Alphonsus Regional Medical Center. Jennifer Krajnik a spokeswoman for the medical center reported on Friday the pilot had died overnight at the hospital. Passengers on United Flight 1603 were put on another aircraft and they were able to complete their trip to SeaTac. An autopsy was conducted on Friday by Ada County Coroner Erwin Sonnenberg who reported that Captain Henry Skillern died at a Boise hospital of a heart attack. Captain Skillern had been a pilot with United Airlines for 26 years.